The Old Cider Press offers all the charm of a stone cottage in the countryside while providing all the stylish comforts of a property that has been modernised to a high standard. 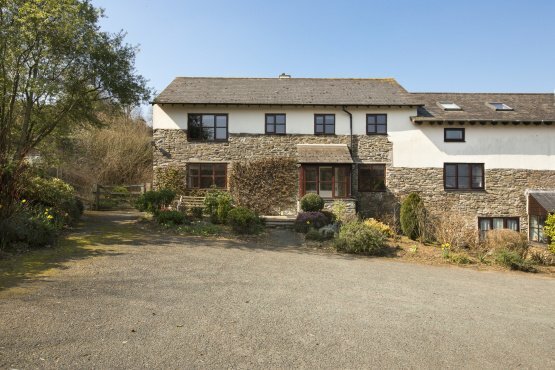 One of six cottages, The Old Cider Press is an attractive end-of-terrace, two-storey property situated in an off-road location in Higher Batson with views of the lovely surrounding South Hams countryside. The property has four bedrooms, an open plan kitchen/dining area and a triple-aspect sitting room. With a window to the front, a bay window to the side and French windows leading out into the rear garden, it is no surprise that the sitting room is full of natural light. An exposed stone wall, a feature found in many of The Old Cider Press’s room, complements an impressive stone fireplace with a timber mantel and slate hearth featuring a wood burning stove with double doors. This property also benefits from approximately 1.5 acres of private grounds, including a paved garden, a forecourt parking area and an adjoining natural piece of land featuring a boat store and workshop.